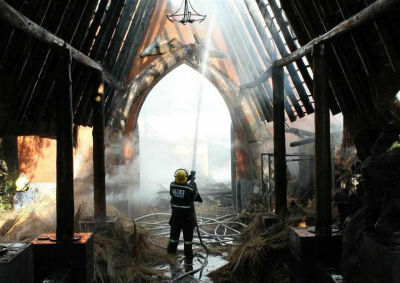 Early in June 2013, the reception area of the popular Misty Hills Hotel was badly damaged when the thatch roof caught fire. Fortunately, no-one was injured in the blaze, and the hotel was back in operation later the same day. Around 40,000 fires occur every year in South Africa, of which around 10,000 are in private homes. Open fireplaces and thatch roofs are not a good combination. Closed-combustion fireplaces are much safer than open fires, because the fire is entirely contained. Once the fire is burning, and the door is closed, there is no chance of sparks escaping into the room. In addition, a closed combustion fireplace is much more efficient than an open fireplace, which means that less fuel is burned to achieve the same degree of heating.